Smash Mountain. Ricky Lee Kalichun. Mr. Shady Shades. A power adapter that looks like Mr. T. And so many more. It was an epic year for the Kotaku 'Shop Contest, thanks to your creativity and drive. Our 50 contests this year featured tons of callbacks to earlier hits, and so now we're going to bring 10 of them together in one great big year-end blowout. And we're going to find out who the real stars are. No, I'm not asking you guys to go back and re-do what would be 200 finalists from across 10 of our most memorable contests. I'm asking you guys to use your creativity and bring them together in an entirely new 'Shop. So while I've never been keen on rules around here, I am laying down one because this is an all-star contest, and also to discourage people from plagiarizing former entries (or, worse, simply resubmitting their own). Your new 'Shop must feature at least two different subjects from the above gallery. And yes, I will give a higher grade to 'Shops that have more than two subjects—hell, I know someone will try for all 10, like it's Presto Magix. Clarification: You're not limited to just these images, if you've got a good idea that needs a completely separate base or background. I am not holding you to, say, taking Mr. Shady Shades out of one image and sticking him on the Smash Mountain Boat. You can combine these with an entirely new image (and other exploitables tossed in) if you like. You could even go way off message and use something from a 'Shop Contest not featured here. Just use something from at least two of the exploitables. 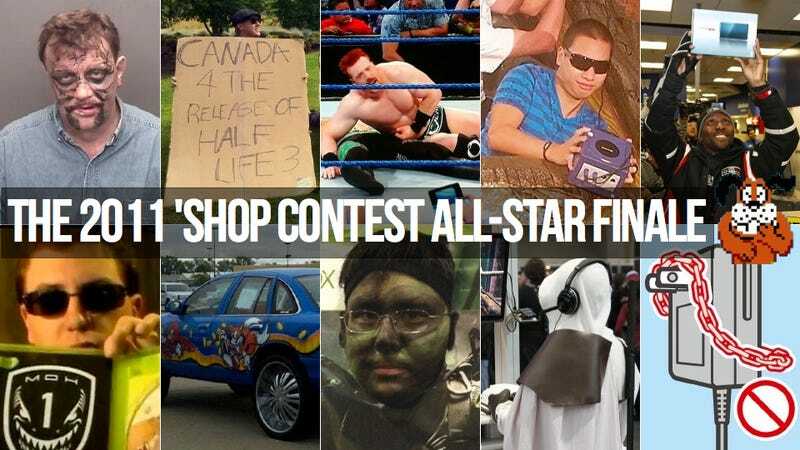 Thank you again to all who have made the Kotaku 'Shop Contest such a fun and popular feature.